I realize this term may seem somewhat like an oxymoron, but for those slightly cooler & cloudy days, there is nothing better than a lightweight airy knit. This one has just the right amount of stretch, slouch & sheerness to it, plus the color is so versatile. Tuck it into a pencil skirt, layer over your swimsuit & cutoffs, or dress up with bright trousers as I did here…the possibilities are endless! we are lucky here in ca that light sweaters pretty much work year round although i think we are having the most humid summer ever!!! i love those trousers every time i see them. and the clutch…adorable! hope you are having fun in CA!!! Those trousers are fabulous!! I love the tab/button detail. I absolutely love the red pants on you! I've been waffling on grabbing an orangey-red pair (the only red pants I have are in rusty henna, from J Crew) but every time I see that bolder color paired with cream, my lusting starts all over again. Love this outfit, Kim! LOVE the pants and how they are super long- it makes your legs go on for days/months/years! Also, love your nail color. Do you happen to remember what color it is??? I'm always looking for the perfect mango-y-coraly-peachy bright. That's not too much to ask, right??? I absolutely LOVE the color of those pants and how long they are. They make your legs go on for days/weeks/years. Also, totally in love with the nail color. Do you remember what it is? I'm always on the hunt for the perfect coral-y/peachy/mango-y bright. So cute! I have these pants. I bought them (like an idiot) not long after my baby was born. I thought I was back in my regular size but I was wrong. Now I am swimming in them. My mom and I were looking at them last week to see how to fix them but since the zipper is on the side I can't fix it. 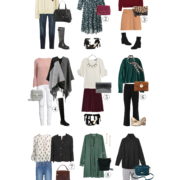 Check out my post tomorrow because I am doing one on sweaters very similar to yours! I wish it was cool enough to wear a sweater! Even at midnight it is still in the 80's! Adore this… never really wore any summer sweaters this season but I should have! Actually, maybe today will be the day. 🙂 Adore you in our LOFT twinsies pants. LOVE this look Kimberly! the sweater looks gorgeous with those red pants 🙂 adorable clutch too! Love this look! 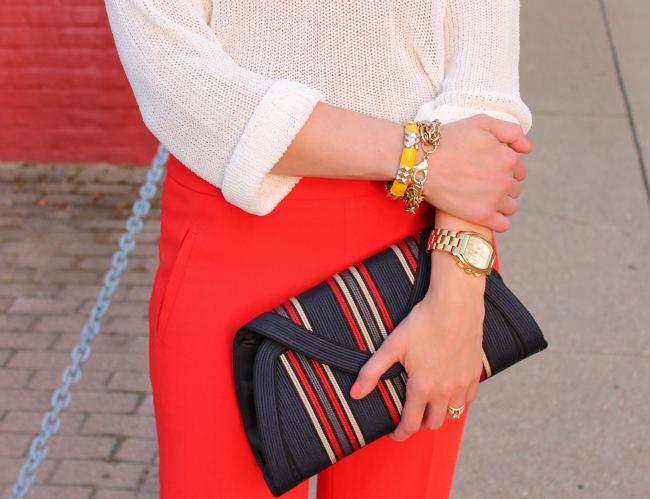 Summer sweaters are a difficult balance, but this one is great with those bright pants! I totally wear sweaters year-round. I mean, maybe not when it's above 85 degrees or so, but as long as it's breathable and 3/4 or less sleeve, I say go for it. This one looks especially summery! The sweater looks to be the perfect weight for summer…great look pairing it with the red! WOW, great pants! Love the colour, it looks great on you! xoxo J. What a great look! Those pants are gorgeous! So very classy! I love your style! I love that clutch! and your outfit, stunning as always Kimberly! Is there anything better than red pants?!?! And those are so flattering on you!! Love this look. That clutch is so pretty! What don't I love about this outfit? Everything looks amazing. I wish I had those pants, they are the perfect silhouette and color! Love this outfit!! Looks so sharp and feminine. Beautiful. Beautiful outfit! I love summer sweaters for those chilly nights. I have post a couple of weeks ago about wearing my open stitch summer sweater. Great minds think alike – working on my post for tomorrow and I am wearing the same pants! Great minds think alike. I am working on my post tomorrow which features the same pants. You look so glamorous! Love the light weight sweater with those fabulous red pants. Love how you put all the chic pieces together….I'm falling in love with that colorful pair of trousers, it can really go a long way!!! What a great outfit on you!! I love a lightweight, slouchy sweater! I LOVE these red pants. They are gorgeous and they look awesome on you! i can't get over how gorgeous these pants are! love the clutch as well. Summer sweaters make me think of my gma (in a good way). I bought one this summer too! I love the last pic of you. You look like a model! The sweater looks like it's not too heavy for warm days – and perfect for the office. I'm constantly cold so I would love a sweater like yours. Chic as always, Kim! Love this outfit. Sadly for me it's way too hot & humid to wear sweaters in the summer. That clutch is so perfect. Love the colors and shape. Fabulous look, I am in love with those pants!